These people aren't clever enough to know what kind of food they want to eat. 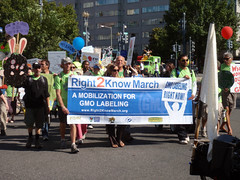 This is the "scientific" reason why we don't want to label GMOs, because these people don't know what's best for them. We don't want to start a consumer panic, where people decide not to eat GMOs by mistake! Funny, it looks to me like they have an opinion! In patronizing scientists - part 1, I covered how those of us who do completely understand the pros and cons of recombinant DNA can still be opposed to GMOs. In this part, I'm just going to explain how lazy these scientists are. If it is true that people do not understand, then explain it to them! The first GMO food hit the market in 1994. That means infants born when GMO food was first made available are old enough to vote in the upcoming presidential election. Seems like we could've been "educated" by now. Yes, it involves science, and yes, we are not the most science-educated culture. But if you understand something well yourself, you ought to be able to explain it to someone else. You might have to adjust your vocabulary, take a bit more time, than when you are talking to another scientist. But it's possible. When my daughter was 4-years-old, she asked me how do you get a boy baby or a girl baby. She did not know the word "chromosome", barely knew the words "eggs" and "seeds" and was still rather confused about how they got together. But I drew pictures of "X eggs" and "X seeds" and "Y seeds" and managed to get the facts across. If consumers don't "understand" GMOs, it's because those who claim they don't understand have been entirely too lazy to convince them. As a diabetic, this just completely cracks me up, saying HFCS is just as healthy as sugar is like saying cyanide is just as healthy as arsenic. But while I think these commercials are stupid, I also think this is the right way to go about it. HFCS is on the label, I get to decide if I want to eat it or not. Even if you DON'T understand the science and cannot make an informed decision, don't you have the right to choose for yourself what you put in your body? I mean, do you need a science degree to order from a menu? And if you're too uneducated to decide what to eat and drink, how the heck are you trusted to choose the next president of the US? IMO, politics is a lot more convoluted than science.